Yummy 3.2 is the second of our apps to get an update for iOS 9. Yummy, however, gets a much more significant update. Support for latest iPhone’s and iPad’s, including split-screen multitasking and 3D touch on supported devices. Supports new “Safari View Controller” on iPhone. 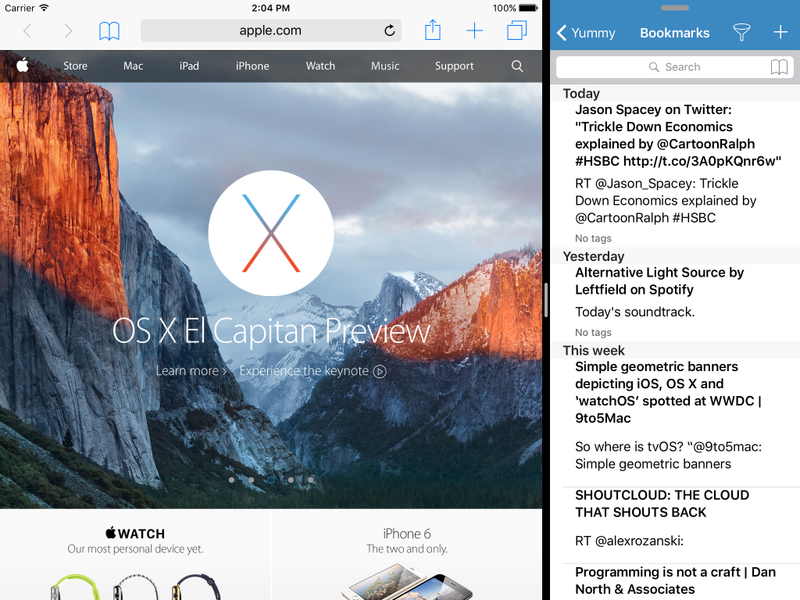 Supports iOS 9’s new Spotlight search feature. After the upgrade has completed, you should see your bookmarks in your search results. 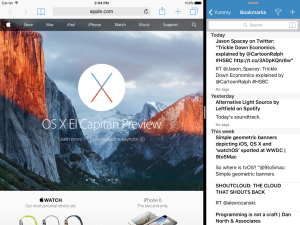 Supports Safari’s new ability for third-party apps to add bookmarks to the “Shared Links” tab. URL scheme. This is not the same as the one used in version 2.x of Yummy and your old bookmarks will not work. See below for the new scheme. Configure which fields appear on bookmark list. Bug fixes and other minor improvements (of course). Yummy 3.2 is built using the latest developer kit and so supports all the latest devices, including the iPhone 6S, iPad mini 4 and iPad Pro. Since Yummy 3, the bookmark list has shown the title, notes, tags and private/public/to read flags. Yummy 3.2 now allows you to customise what you see, so if you want to see the URL but not your tags, now you can. Go to the Settings screen to edit. I just submitted it to Apple for review. Hopefully it should be available to download in about a week.